There are just a few spots left. Sign up by Thursday May 12 noon! Only $45 per participant ($40 for members)! 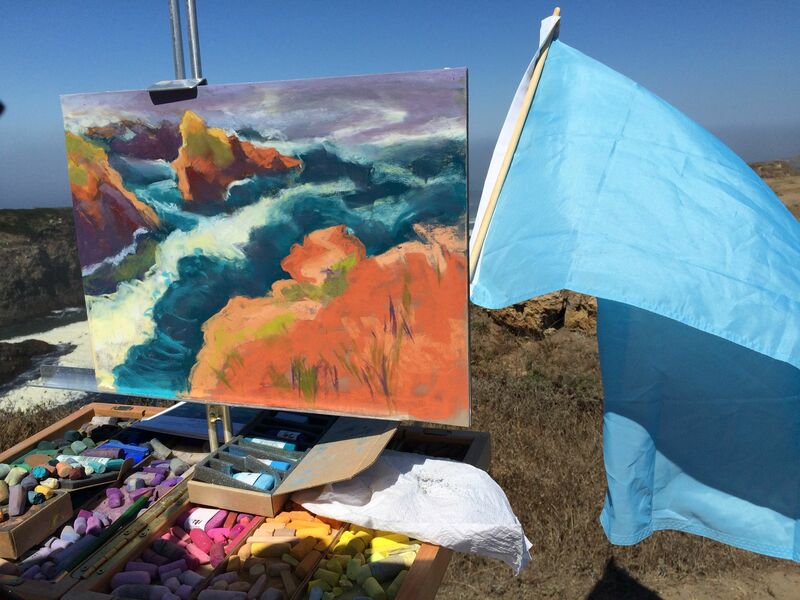 Explore plein air painting with me! Deepen your observational skills and express your responses to Pepperwood’s verdant and blossoming spring landscape. The continuing rains have gifted us with wildflower joy this year! Beginning painters: learn basics of working in the field. Experienced painters: expand your repertoire with elements of realism, impressionism, expressionism, with support for finding your own voice. Demonstrations in oil but you may use any media. There will be color hors d’oeuvres and tasty demos of pastel and watercolor at noon each day of my open studio (click for catalog page), Oct 10, 11, 17, 18. Click for map. I’ve always loved an essay by Henry Miller in “Paint as You Like and Die Happy” about hungry painters discussing the juicy names of colors like hors d’oeuvres! Here’s the container for my tasty new pastel palette. Good enough to eat?! I researched many pastel boxes and easels ’til settling on this Heilman backpacking box. I might like a larger box, but not a heavier one. Then I made a switch from my trusty but weighty French easel to an old camera tripod, attaching a “quick release” gadget from the photo store (Glad I brought my filled pastel box and tripod along to work it out. ), inserting the Heilman metal easel into the two pre-drilled holes in the opened pastel box. This, theoretically, lightened the potential load by 6 pounds. I attach my Bestbrella to the tripod legs. I can carry all into a deep backpack. My new plein air pastel set up is a work in progress. It was a dramatic move to peel and break off chunks from my collections of many years, stored in several kinds of boxes, mostly Unison, Rembrandt, Nupastel, Sennelier, with additional samples from Terry Ludwig, Diane Townsend, Schmincke, and more. Sometimes I’ve bought pastels in sets, when they come in their own box, sometimes by the stick. Creating and recreating order after making each painting, light to dark, warm to cool, more or less, and cleaning the pastels to let their color shine through and speak with each other, is an intellectual, meditative and time-taking experience. I had my misgivings about the stability of this set-up. So far it held up well painting during Mendocino Open Plein Air, which was a week of extraordinarily calm and sunny coastal weather. http://www.mendocinoartcenter.org/pleinair. The blue flag was for viewers to find the “celebrity artists”. I was the pastel specialist, a good motivation for setting a deadline to reorganize. 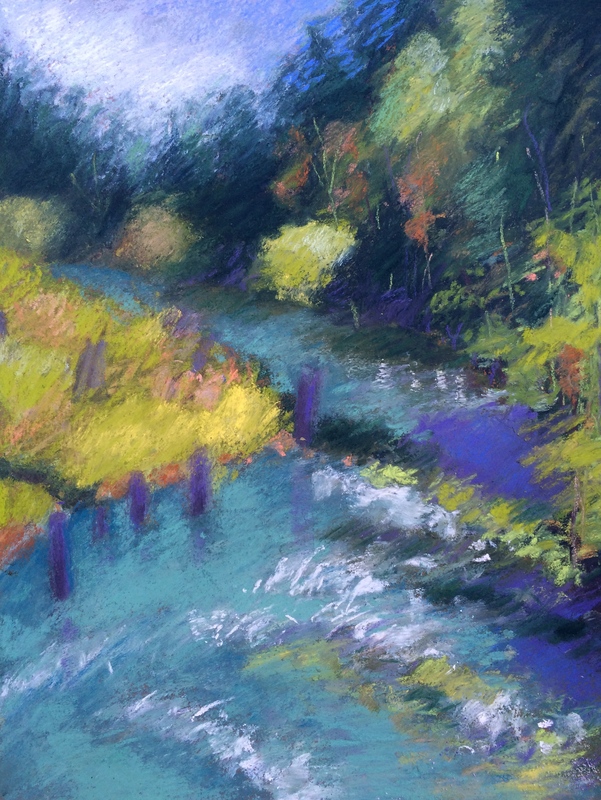 And two weeks before I taught a Mendocino Art Center workshop “Lively Pastels”. I’ll teach this again April 16-17, 2016. It’s harder to detach the box than to set up. Inside, I use a table and/or a studio easel and keep carrying pastel paintings outside to knock off the extra dust between layers. Thank you Jan Thomas for this excellent interview and introduction to members of the Pastel Society of the West Coast, which I recently joined while attending #PACE15, the Plein Air Convention in Monterey, CA. As it is only available by email, I am republishing the interview here, with Jan’s permission. I’ve added information about the Pastel Society from their website at the end . I observe the place: mood, shapes, color, and spatial relationships. I reflect on how the sense of place affects my own interior landscape. I am attentive to nuances of color and value, but do not require fidelity to local color; expressive color often feels more true. Watching, listening, trusting intuition and gesture, infuse my painterly representation with an abstract sensibility. 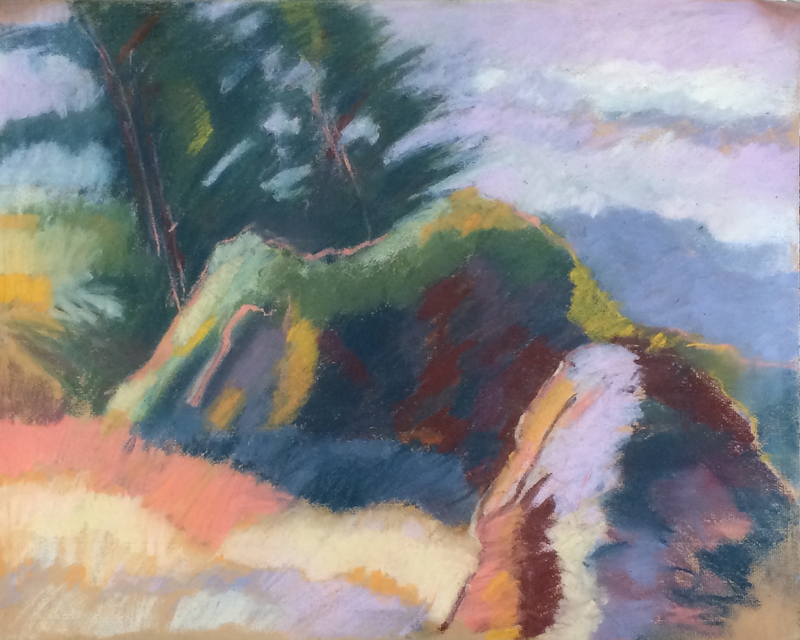 When looking at one of Marsha Connell’s expressionist paintings, in both pastel and oil, one can almost see the dancer that she is moving across the surface leaving behind rhythmic nuances of gesture and color. 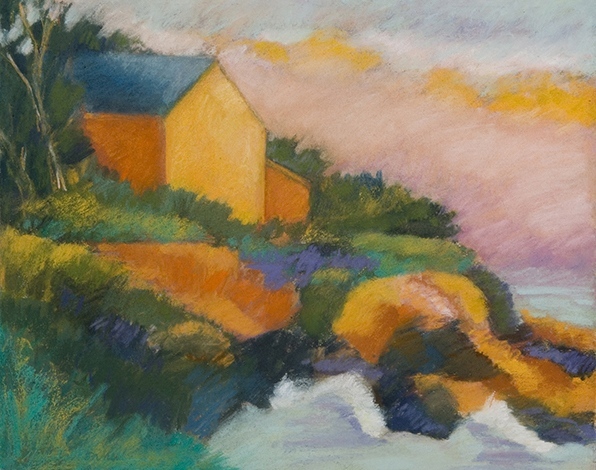 A plein air painter, Marsha developed a deep connection to the land as a child. Her grandfather, Samuel Riss, a farmer in upstate New York, was also an artist who influenced Marsha’s love of drawing and encouraged her to pursue her craft with diligence and courage. Today, she has shelves of sketchbooks saved from years of sketching outdoors, filled with energetic drawings of landscapes. She says these drawings are dialogs with nature, creating an attachment to the living world, and birthing paintings that portray mood and feeling. Her plein air forays always include sufficient time to roam and to do as many sketches as necessary to get a sense of connection with a place. When she begins to paint, this energy is translated directly to her surface; rarely does she start with an initial drawing. Instead, she relishes the immediacy of putting pigment to paper with a “get it before it’s gone” intensity. Her colors are “responsive to nature”, but she relies on intuition to provide what she feels the painting needs. 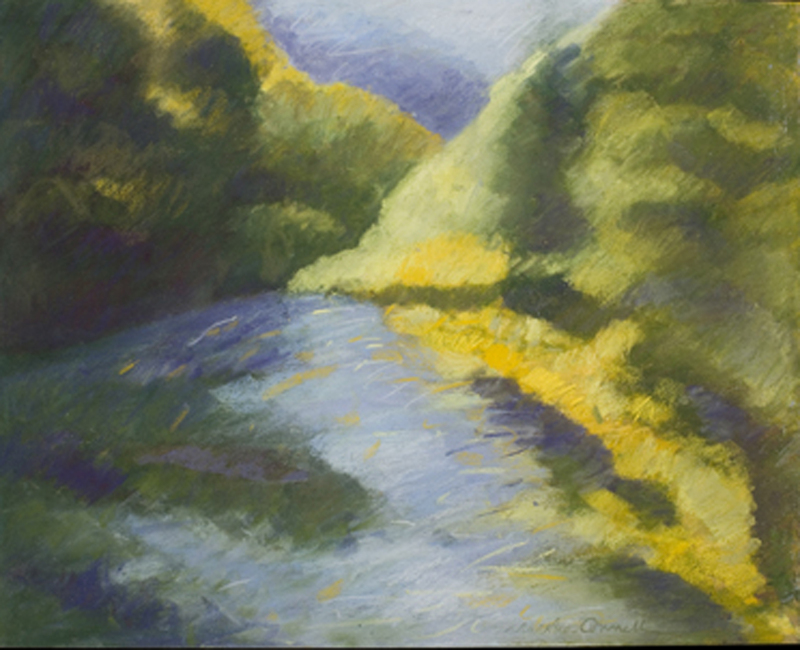 Marsha’s first and ongoing love in painting is pastel, for its natural connection to drawing, the immediacy of pure color, the shimmer of its layering, and the convenience of carrying into the landscape. 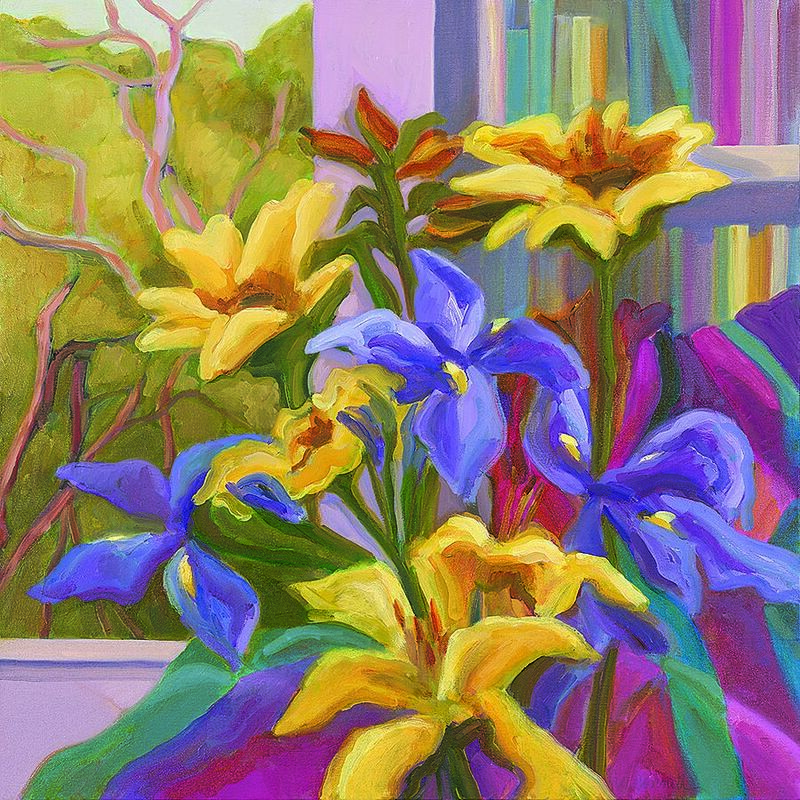 Her natural voice in pastel comes through in her oil and watercolor paintings, especially in the soft edges, visible brush strokes like drawing, and scumbled color over color. Marsha is a long-time Adjunct Professor of Art at Santa Rosa Junior College and also teaches workshops throughout the year. Her goals as a teacher are to offer people tools and working processes that give them comfort and confidence to explore and create with joy. She supports people in finding their own context and path and their authenticity as artists. While she is happy to demonstrate technique and supplies, she also offers a broader artistic scope, introducing students to the work of other artists, current and past, and inviting dialog that stimulates creativity and expression. She encourages students to take advantage of the workshop setting to try new things, to approach many subjects courageously, and to allow their paintings to be unfinished works in progress. 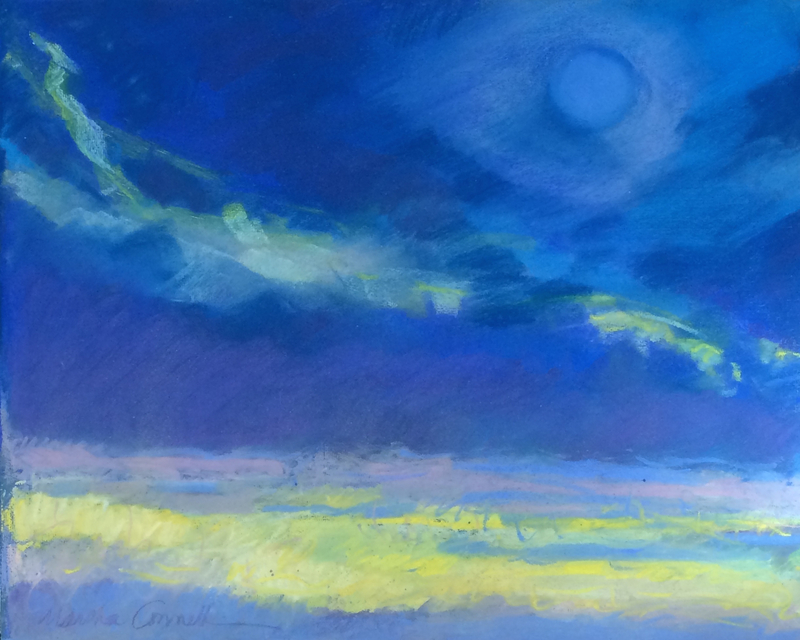 Marsha will be a celebrity artist, and give pastel painting demonstrations, for the Mendocino Art Center’s Mendocino Open Paint Out, September 7-12, 2015. Want to be a Featured Artist on the eBlast? In an effort to get to know you, PSWC will feature a member artist every month in the eBlast. If you would like to be the featured artist in the newsletter, submit your name, telephone number and a photo of your recent work to president@pwcs.ws You will be directed to the website, click on Contact. PSWC was organized in 1984 to promote pastel artists and the soft pastel medium. Informative demonstrations by recognized pastel artists. An emailed Newsletter for pastel artists is included with PSWC membership and all pastelists are invited to join. Pastel workshops, classes, exhibitions and pastel related editorial articles can be found in the newsletter. PSWC members are from all around the US from New York to California. 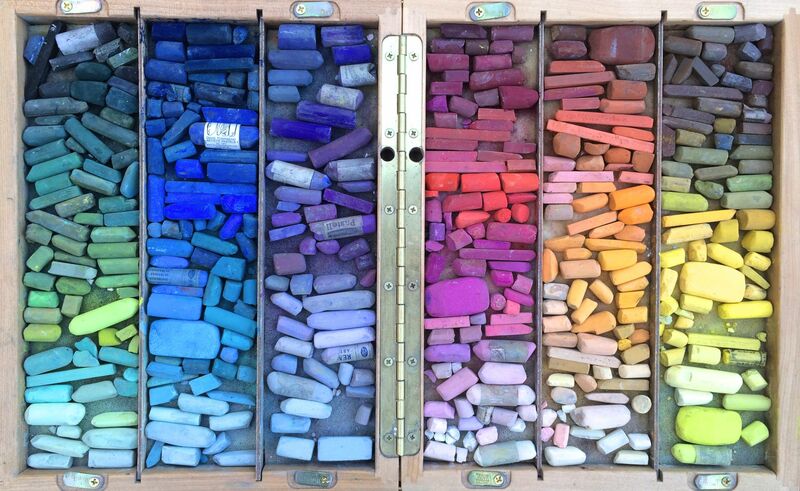 The Pastel Society of the West Coast is incorporated as a non-profit organization. The PSWC is run completely by volunteer Board Members and others. I’ve just returned from 5 days in Monterey at “the Woodstock of plein air painting” with 700+ painters at #PACE15, the 4th Annual Plein Air Convention and Expo. 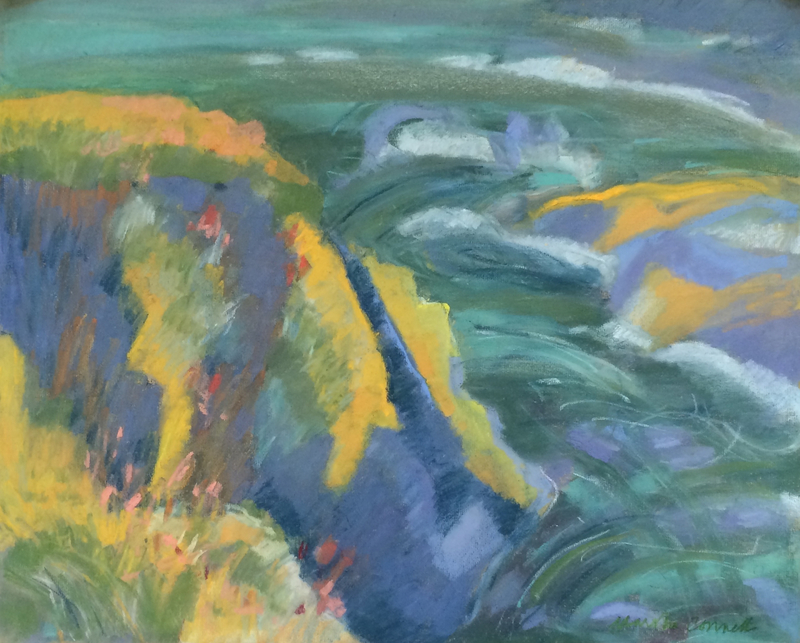 I attended lectures, demos and critiques by many accomplished artists in oil, pastel and watercolor, and painted every afternoon on the beautiful, and windy, central coast of California. 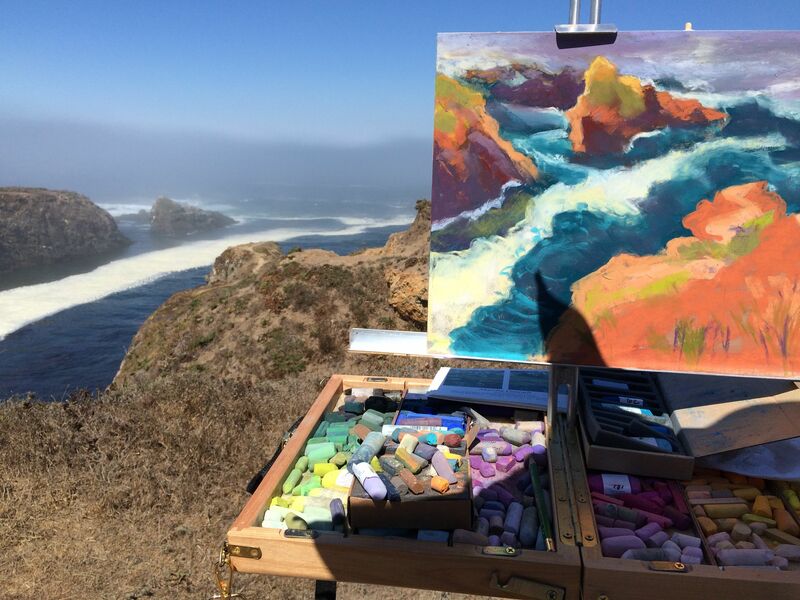 I’m refreshed and re-inspired to share the joys of the plein air painting experience with others! 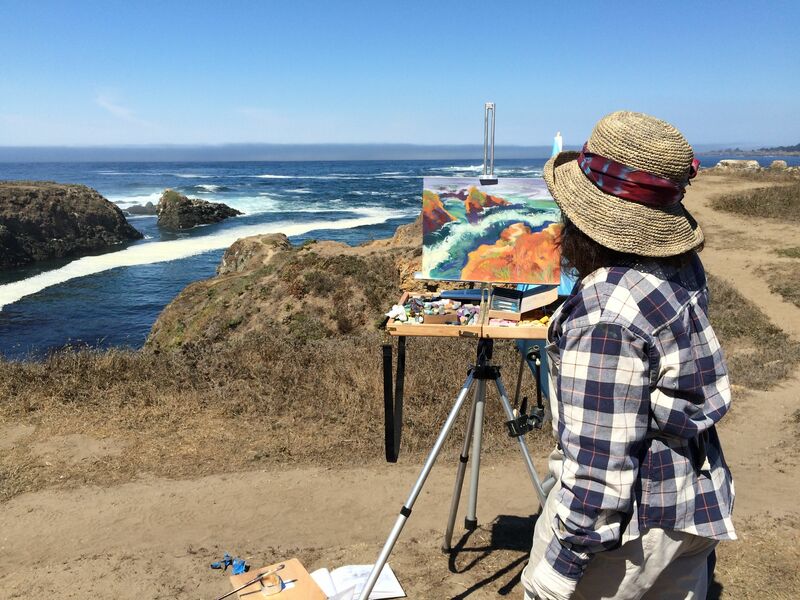 Spend an exciting weekend painting on location in iconic Sonoma County landscapes with Santa Rosa Junior College instructor Marsha Connell. Engage your senses and the body to awaken an energetic connection with the land. Plein air painters share a commitment with scientists to deep observation, to documenting and protecting our open spaces for future generations, and to sharing the joys and solace of nature. Beginning painters: learn basics of working in the field. Experienced painters: practice and expand your repertoire. Explore aspects of realism, impressionism, expressionism, or abstraction. Enjoy support for finding your own painting voice to express the spirit of this special place. Use any painting or drawing media. Demonstrations will be given in oils, drawing, and pastel. You are invited to stay overnight at the Bechtel House or camp under the stars. The retreat includes moderate hikes of less than a mile at a slow pace with long stops. A catered dinner Saturday night and continental breakfast on Sunday are included. Saturday’s schedule includes evening sunset painting. A materials list and instructions will be sent to participants in advance.